What must it be like to have to fight for a simple meal? Four eight year old children in a forgotten corner of a South African township invite us into their daily life at school. Whether they are the bullied or the bullies, their heartbreaking confessions reveal the roots of violence in their society. In the small township of Alexandra in Johannesburg, children stream excitedly out of a classroom. It's lunchtime but Thabo, big for his age and known to be a bully, stays inside. "I go to school every day without any food or money for lunch", he sobs. So Thabo and his 'crew' steal money and the lunchboxes of those lucky enough to have one. Their parents are quick to punish their offspring, yet their teacher sees this as an issue in itself: "we have a real problem here", admits Patrick, the teacher, "because children see violence at home and they imitate it". "Obama is always beating me and teasing me about my mother" sobs Gift, the son of an AIDS victim. Looked after by his loving grandmother, Gift's learned to avoid confrontation as much as possible. Yet for the confident boy nicknamed 'Obama' for his looks, violence is a fact of life: "I caught Obama waving a knife at some boys", says his uncle, "I beat him but it doesn't seem to work". 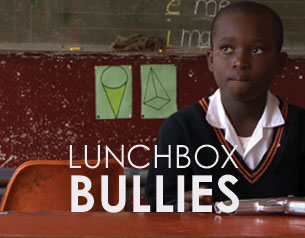 Such extreme cases of bullying forced Patrick to take action and visit his pupils at home. "I couldn't communicate with them until I understood their backgrounds", he explains. Yet finding the patterns of poverty, abuse and simple neglect in his pupils' lives, provided more questions than answers. "I cook, eat and then go to sleep on my own", explains Ghundi, who often steals other childrens' lunchboxes at school. Yet his aunt expresses anger at having to deal with an eleven year old bully, alone. "What must I do?" she cries, "I must discipline him. I was disciplined!" Like many guardians, she believes the school should do more to reprimand ill-behaved children. Yet all the school can do is try to understand why their pupils are acting this way: "Thabo's mother and he fight every day", sighs Principal Thembi, "and that's why he hits girls". "I'm not happy", says Tshidi, staring at her too-small shoes, "if I say anything, they tell me to go back to Zimbabwe". Tshidi knows that she'll always be hated for being different, so she sits alone and "tries to get an education". For one of these children it may be too late: "Thabo will drop out in a year", predicts Principal Thembi, "he's already started cutting class". Yet the others still have dreams, to be a businesswoman, a soldier, or quite simply: "like this man I know who has a house and a car". This beautifully observed documentary, begs the question: what must be done for these dreams to be realized? 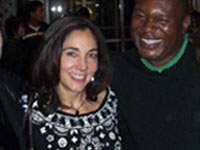 Nhlanhla Mthethwa and Nadiva Schraibman co-directed Lunchbox Bullies. It is their first project together. "A friend of mine who was editing a monograph for the Centre for Justice and Crime Prevention (a South African NGO), asked if I could proof read it for her. The study was on youth violence in South Africa. It detailed the most common incidents of youth violence; that the perpetrators were often youth on youth and the consequences that this behaviour has on our society."